Terry Glavin: Liberté, égalité, fraternité. "The contradiction is a symptom of a deeper philosophical quagmire born of a sense of guilt felt by some Westerners for past sins, both real and imagined, committed against the non-Western 'other.' Western guilt yields a state of perpetual self-loathing, which in turn leads its victims to celebrate any anti-Western cause as morally worthy. Thus, when Egyptians--rightly--rebel against a pro-American autocracy, their cause is automatically perceived as just. However, if Iranians rise up in pursuit of similar goals against a far worse, anti-American and totalitarian regime--one that murders its own citizens in the name of God--Americans are asked to stay silent. "But as events unfolding in places like Tunisia and Egypt make clear, political change is the Muslim world’s new reality. 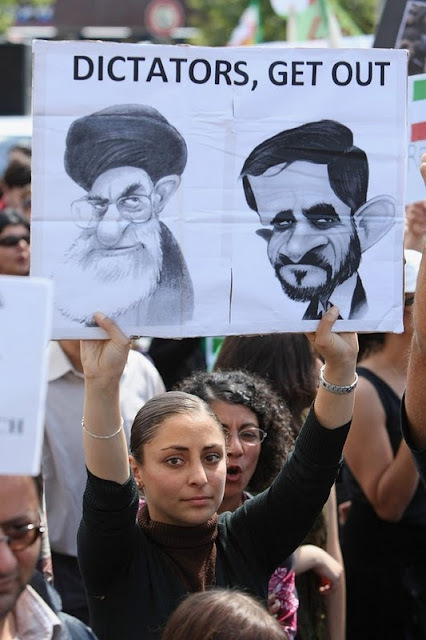 Iran, too, will once again become the battleground between citizens asserting their fundamental rights and a regime committed to perpetuating its unjust rule. When that day arrives, will the left once again respond with fear and loathing--or truly embrace universal values?" Exchanging a parliamentary dictator for a junta is not a democratic revolution; this has all the appearance of a rejuvenation of the 1952 military coup that deposed King Farouk. In the wake of Mubarak's resignation there has been no strong alternative emerge as an alternative to military rule. My fear, should the junta allow free elections, is that the Muslim Brotherhood will emerge as the central figure in some coalition of the disaffected. Such a result would likely become a "one man, one vote, one time" affair and Egypt would emerge as another anti-Western Islamic theocracy to bookend Iran. However, if what I call "status twitterus" was to infect Iran before Egyptians went to the polls, then perhaps the inertia of change will stay with the modernist youth and prevent annother mullah-cracy from blighting the middle east. In my wildest dreams, the infection spreads to Saudi Arabia and China too. doc bacon, c'mon now. Deep breath time. "...this has all the appearance of a rejuvenation of the 1952 military coup that deposed King Farouk." Really? Don't you think we should celebrate Egyptian people's historic moment to rid themselves of Mubarak? The Muslim Brotherhood might be a concern, but they weren't at the center of this popular revolt. Of course things could change, even go off the rails, but we can't demand an outcome ahead of the struggle. Struggling for democracy is tough. Let's give the Egyptians some credit. OK, Rob, deep breath time: in with the new boss, same as the old boss. Sorry to be the wet blanket, but the new boss is just a new face for the junta that took over from the King in 1952. In the absence of another suitor bidding to support an Egyptian client regime (a la the USSR prior to Sadat's shift west) there is a chance that the military will succumb to US pressure to allow real regime change. For that very reason, the combined efforts of France, Britain, Germany, and the UN to influence the junta will amount to nothing unless they pool together the 1.4 billion to outbid America's annual payments to keep Egypt from rejoining the war on the Jewish infidels. That said, my best wishes go out to those Egyptians who are fighting for secular democracy - especially if they have the effect of promoting those politics in the rest of the Arab dictatorships of the middle east. Even without those spinoff benefits, the Egyptians deserve all the support Canada can give them to become a modern democracy and avoid the pitfalls of Islamist tyranny. Doc and Rob: You're both right, but Rob more so. Doc: When you say we're seeing "just a new face for the junta," take out the word "just" and you'll notice that the form of the transitional government says nothing about its function, which is a response to a thoroughly revolutionary upheaval that is by no means merely the exchange of a dictator for a junta. That would be all it was had we not seen hundreds of thousands throng day after day in Egypt's cities. A shift from a dictator to a junta is an end of something. What we saw last week was a beginning, not an end. What is was that began, however - we will see, and we will hope. True, Terry: time will tell whether the junta perceives the determined presence of the protestors as a time for change, or a sign that times have already changed. Mubarak resigned, indicating that the military was not prepared to enforce his rule. I'd like to believe that this means the junta is going to prepare for free and open elections; I also hope that Egyptians are not going to trade their military dictator for the dubious freedoms of a 13th century theocracy. Perhaps the ability of new technologies like Twitter to spread and maintain an idea will eventually overcome tyranny everywhere. I've had my hopes up before, watching the Chinese in Tiananmen Square in '89, so I'm happy to see the Egyptian military sitting this one out. President Mubarak has been removed and replaced with the "Higher military Council", led by Mubarak's former defence chief, Field Marshal Mohamed Hussein Tantawi. Prime Minister Ahmed Shafiq, appointed last week by Mubarak, said government affairs were being presented to the Higher Military Council, “as they were [formerly]presented to the president of the republic." “There is no change in the form, method or process of work. Matters are completely stable,” he told a news conference. Good news is they promise to leave in six months or sooner if elections can be held.